Infarctions may occur for a variety of reasons, but coronary thrombosis of a coronary artery narrowed with plaque is the most common cause. 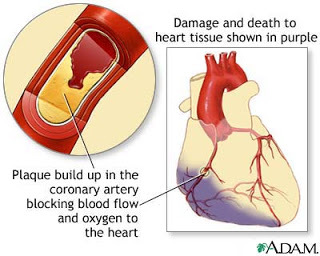 Other causes include spasms of the coronary arteries; blockage of the coronary arteries by embolism of thrombi, fatty plaques, air, or calcium; and disparity between myocardial oxygen demand and coronary arterial supply. Multiple risk factors have been identified for coronary artery disease and MI. Modifiable risk factors include cigarette smoking, which causes arterial vasoconstriction and increases plaque formation. A diet high in saturated fats, cholesterol, sugar, salt, and total calories increases the risk for MIs. Elevated serum cholesterol and low-density lipoprotein levels increase the chance for atherosclerosis. Hypertension and obesity increase the workload of the heart, and diabetes mellitus decreases the circulation to the heart muscle. Hostility and stress may also increase sympathetic nervous system activity and pose risk. A sedentary lifestyle diminishes collateral circulation and decreases the strength of the cardiac muscle. Medications can also prevent risks. Oral contraceptives may enhance thrombus formation, cocaine use can cause coronary artery spasm, and anabolic steroid use can accelerate atherosclerosis. Some factors—such as age, family history, and gender—cannot be modified. Aging increases the atherosclerotic process, family history may increase the risk by both genetic and environmental influences, and males are more prone to MIs than are premenopausal women. Premenopausal women have the benefit of protective estrogens and a lower hematocrit, although heart disease is on the rise in this population, possibly because of an increased rate of smoking in women. Once women become postmenopausal, their risk for MI increases, as it also does for men over age 50. Region/ Radiation Substernal or retrosternal, which may radiate to shoulder, arms, neck, lower jaw, or upper abdomen slight to the left side. Substernal or retrosternal, which may radiate to shoulder, arms, neck, lower jaw, or upper abdomen slight to the left side. Timing Pain usually is 1 to 3 minutes up to 10 minutes long, or may even last up to 15 to 20 minutes. This pain can be relieved by rest or Nitroglycerin (vasodilator) Pain usually last for 20 minutes or even hours. This type of pain is not relieved by rest or Nitroglycerin, but could be addressed by Morphine Sulfate (narcotic analgesic). Associated Symptoms Dyspnea, nausea and vomiting, sweating, and weakness. Dyspnea, nausea and vomiting, sweating, and weakness. Pathophysiology A temporary myocardial ischemia which is usually secondary coronary atherosclerosis. A prolonged myocardial ischemia which leads to an irreversible myocardial damage or necrosis. Serial 12-lead electrocardiograms (ECGs) detect changes that usually occur within 2 to 12 hours, but may take 72 to 96 hours. Q waves indicate tissue necrosis and are permanent. Nonspecific enzymes including aspartate transaminase, lactate dehydrogenase, and myoglobulin may be elevated. The goals of medical management are to minimize myocardial damage, preserve myocardial function, and prevent complications such as lethal dysrrhythmias and cardiogenic shock. Oxygen administration is initiated at the onset of chest pain. Reperfusion via emergency use of thrombolytic medications or percutaneous coronary interventions (PCI). Coronary artery bypass or minimally invasive direct coronary bypass (MIDCAB). For relief of pain. This is a priority. Pain may cause shock. Morphine Sulfate. Lidocaine or Nitroglycerine administered intravenously. To disitegrate blood clot by activating the fibrinolytic processes. Streptokinase, urokinase and tissue plasminogen activator (TPA) are currently used. Adminstration is most crucial between 3 to 6 hours after the initial infarction has occurred. Assess neurologic status changes which may indicate G.I. bleeding or cardiac tamponade. Anticoagulant and antiplatelet medications are administered after thrombolytic therapy to maintain arterial patency. Be sure the patient understands all the medications, including the dosage, route, action, and adverse effects. Instruct the patient to keep the nitroglycerin bottle sealed and away from heat. The medication may lose its potency after the bottle has been opened for 6 months. If the patient does not feel a sensation when the tablet is put under the tongue or does not get a headache, the pills may have lost their potency. Explain the need to treat recurrent chest pain or MI discomfort with sublingual nitroglycerin every 5 minutes for three doses. If the pain persists for 20 minutes, teach the patient to seek medical attention. If the patient has severe pain or becomes short of breath with chest pain, teach the patient to take nitroglycerin and seek medical attention right away. Explore mechanisms to implement diet control, an exercise program, and smoking cessation if appropriate. Verbalize relief/control of chest pain within appropriate time frame for administered medications. Display reduced tension, relaxed manner, ease of movement. Demonstrate use of relaxation techniques. Monitor/document characteristics of pain, noting verbal reports, nonverbal cues (e.g., moaning, crying, restlessness, diaphoresis, clutching chest, rapid breathing), and hemodynamic response (BP/heart rate changes). Variation of appearance and behavior of patients in pain may present a challenge in assessment. Most patients with an acute MI appear ill, distracted, and focused on pain. Verbal history and deeper investigation of precipitating factors should be postponed until pain is relieved. Respirations may be increased as a result of pain and associated anxiety; release of stress-induced catecholamines increases heart rate and BP. Obtain full description of pain from patient including location, intensity (0–10),duration,characteristics(dull/crushing), and radiation. Assist patient to quantify pain by comparing it to other experiences. Pain is a subjective experience and must be described by patient. Provides baseline for comparison to aid in determining effectiveness of therapy, resolution/progression of problem. Review history of previous angina, anginal equivalent, or MI pain. Discuss family history if pertinent. May differentiate current pain from preexisting patterns, as well as identify complications such as extension of infarction, pulmonary embolus, or pericarditis. Instruct patient to report pain immediately. Delay in reporting pain hinders pain relief/may require increased dosage of medication to achieve relief. In addition, severe pain may induce shock by stimulating the sympathetic nervous system, thereby creating further damage and interfering with diagnostics and relief of pain. Provide quiet environment, calm activities, and comfort measures (e.g., dry/wrinkle-free linens, backrub). Approach patient calmly and confidently. Decreases external stimuli, which may aggravate anxiety and cardiac strain, limit coping abilities and adjustment to current situation. Assist/instruct in relaxation techniques, e.g., deep/slow breathing, distraction behaviors, visualization, guided imagery. Helpful in decreasing perception of/ response to pain. Provides a sense of having some control over the situation, increase in positive attitude. Check vital signs before and after narcotic medication. Hypotension/respiratory depression can occur as a result of narcotic administration. These problems may increase myocardial damage in presence of ventricular insufficiency. Administer supplemental oxygen by means of nasal cannula or face mask, as indicated. Increases amount of oxygen available for myocardial uptake and thereby may relieve discomfort associated with tissue ischemia. Administer medications as indicated:Antianginals, e.g., nitroglycerin (Nitro-Bid, Nitrostat, Nitro-Dur), isosorbide denitrate (Isordil), mononitrate (Imdur) Nitrates are useful for pain control by coronary vasodilating effects, which increase coronary blood flow and myocardial perfusion. Peripheral vasodilation effects reduce the volume of blood returning to the heart (preload), thereby decreasing myocardial workload and oxygen demand. Beta-blockers, e.g., atenolol (Tenormin), pindolol(Visken), propranolol (Inderal), nadolol (Corgard), metoprolol (Lopressor) Important second-line agents for pain control through effect of blocking sympathetic stimulation, thereby reducing heart rate, systolic BP, and myocardial oxygen demand. May be given alone or with nitrates. Note: beta-blockers may be contraindicated if myocardial contractility is severely impaired, because negative inotropic properties can further reduce contractility. Analgesics, e.g., morphine, meperidine (Demerol) Although intravenous (IV) morphine is the usual drug of choice, other injectable narcotics may be used in acute-phase/recurrent chest pain unrelieved by nitroglycerin to reduce severe pain, provide sedation, and decrease myocardial workload. IM injections should be avoided, if possible, because they can alter the CPK diagnostic indicator and are not well absorbed in underperfused tissue. Demonstrate measurable/progressive increase in tolerance for activity with heart rate/rhythm and BP within patient’s normal limits and skin warm, pink, dry. Report absence of angina with activity. Record/document heart rate and rhythm and BP changes before, during, and after activity, as indicated. Correlate with reports of chest pain/shortness of breath. (Refer to ND: Cardiac Output, risk for decreased.) Trends determine patient’s response to activity and may indicate myocardial oxygen deprivation that may require decrease in activity level/return to bedrest, changes in medication regimen, or use of supplemental oxygen. Encourage rest (bed/chair) initially. Thereafter, limit activity on basis of pain/ adverse cardiac response. Provide nonstress diversional activities. Reduces myocardial workload/oxygen consumption, reducing risk of complications (e.g., extension of MI).Note: American Heart Association/American College of Cardiology guidelines (1996) suggest that patients with cardiac conditions should not be kept in bed longer than 24 hr. Patients with uncomplicated MI are encouraged to engage in mild activity out of bed, including short walks 12 hr after incident. Instruct patient to avoid increasing abdominal pressure, e.g., straining during defecation. Activities that require holding the breath and bearing down (Valsalva maneuver) can result in bradycardia (temporarily reduced cardiac output) and rebound tachycardia with elevated BP. Explain pattern of graded increase of activity level, e.g., getting up to commode or sitting in chair, progressive ambulation, and resting after meals. Progressive activity provides a controlled demand on the heart, increasing strength and preventing overexertion. Review signs/symptoms reflecting intolerance of present activity level or requiring notification of nurse/physician. Palpitations, pulse irregularities, development of chest pain, or dyspnea may indicate need for changes in exercise regimen or medication. Refer to cardiac rehabilitation program. Provides continued support/additional supervision and participation in recovery and wellness process. Identify and acknowledge patient’s perception of threat/situation. Encourage expressions of, and do not deny feelings of, anger, grief, sadness, fear. Coping with the pain and emotional trauma of an MI is difficult. Patient may fear death and/or be anxious about immediate environment. Ongoing anxiety (related to concerns about impact of heart attack on future lifestyle, matters left unattended/unresolved, and effects of illness on family) may be present in varying degrees for some time and may be manifested by symptoms of depression. Note presence of hostility, withdrawal, and/or denial (inappropriate affect or refusal to comply with medical regimen). Research into survival rates between type A and type B individuals and the impact of denial has been ambiguous; however, studies show some correlation between degree/expression of anger or hostility and an increased risk for MI. Maintain confident manner (without false reassurance). Patient and SO can be affected by the anxiety/uneasiness displayed by health team members. Honest explanations can alleviate anxiety. Observe for verbal/nonverbal signs of anxiety, and stay with patient. Intervene if patient displays destructive behavior. Patient may not express concern directly, but words/actions may convey sense of agitation, aggression, and hostility. Intervention can help patient regain control of own behavior. Accept but do not reinforce use of denial. Avoid confrontations. Denial can be beneficial in decreasing anxiety but can postpone dealing with the reality of the current situation. Confrontation can promote anger and increase use of denial, reducing cooperation and possibly impeding recovery. Orient patient/SO to routine procedures and expected activities. Promote participation when possible. Predictability and information can decrease anxiety for patient. Answer all questions factually. Provide consistent information; repeat as indicated. Accurate information about the situation reduces fear, strengthens nurse-patient relationship, and assists patient/SO to deal realistically with situation. Attention span may be short, and repetition of information helps with retention. Encourage patient/SO to communicate with one another, sharing questions and concerns. Sharing information elicits support/comfort and can relieve tension of unexpressed worries. Provide privacy for patient and SO. Allows needed time for personal expression of feelings; may enhance mutual support and promote more adaptive behaviors. Provide rest periods/uninterrupted sleep time, quiet surroundings, with patient controlling type, amount of external stimuli. Conserves energy and enhances coping abilities. Support normality of grieving process, including time necessary for resolution. Can provide reassurance that feelings are normal response to situation/perceived changes. Encourage independence, self-care, and decision making within accepted treatment plan. Increased independence from staff promotes self-confidence and reduces feelings of abandonment that can accompany transfer from coronary unit/discharge from hospital. Encourage discussion about post discharge expectations. Helps patient/SO identify realistic goals, thereby reducing risk of discouragement in face of the reality of limitations of condition/pace of recuperation. Administer antianxiety/hypnotics as indicated, e.g., alprazolam (Xanax), diazepam (Valium), lorazepam (Ativan), flurazepam (Dalmane). Promotes relaxation/rest and reduces feelings of anxiety. Maintain hemodynamic stability, e.g., BP, cardiac output within normal range, adequate urinary output, decreased frequency/absence of dysrhythmias. Demonstrate an increase in activity tolerance. Auscultate BP. Compare both arms and obtain lying, sitting, and standing pressures when able. Hypotension may occur related to ventricular dysfunction, hypoperfusion of the myocardium, and vagal stimulation. However, hypertension is also a common phenomenon, possibly related to pain, anxiety, catecholamine release, and/or preexisting vascular problems. Orthostatic (postural) hypotension may be associated with complications of infarct, e.g., HF. Evaluate quality and equality of pulses, as indicated. Decreased cardiac output results in diminished weak/thready pulses. Irregularities suggest dysrhythmias, which may require further evaluation/monitoring. Auscultate heart sounds:Note development of S3, S4; S3 is usually associated with HF, but it may also be noted with the mitral insufficiency (regurgitation) and left ventricular overload that can accompany severe infarction. S4 may be associated with myocardial ischemia, ventricular stiffening, and pulmonary or systemic hypertension. Presence of murmurs/rubs. Indicates disturbances of normal blood flow within the heart, e.g., incompetent valve, septal defect, or vibration of papillary muscle/chordae tendineae (complication of MI). Presence of rub with an infarction is also associated with inflammation, e.g., pericardial effusion and pericarditis. Auscultate breath sounds. Crackles reflecting pulmonary congestion may develop because of depressed myocardial function. Monitor heart rate and rhythm. Document dysrhythmias via telemetry. Heart rate and rhythm respond to medication, activity, and developing complications. Dysrhythmias (especially premature ventricular contractions or progressive heart blocks) can compromise cardiac function or increase ischemic damage. Acute or chronic atrial flutter/fibrillation may be seen with coronary artery or valvular involvement and may or may not be pathological. Note response to activity and promote rest appropriately. (Refer to ND: Activity intolerance.) Overexertion increases oxygen consumption/demand and can compromise myocardial function. Have emergency equipment/medications available. Sudden coronary occlusion, lethal dysrhythmias, extension of infarct, and unrelenting pain are situations that may precipitate cardiac arrest, requiring immediate life-saving therapies/transfer to CCU. Administer supplemental oxygen, as indicated Increases amount of oxygen available for myocardial uptake, reducing ischemia and resultant cellular irritation/dysrhythmias. Measure cardiac output and other functional parameters as appropriate. Cardiac index, preload/afterload, contractility, and cardiac work can be measured noninvasively with thoracic electrical bioimpedance (TEB) technique. Useful in evaluating response to therapeutic interventions and identifying need for more aggressive/emergency care. Maintain IV/Hep-Lock access as indicated. Patent line is important for administration of emergency drugs in presence of persistent lethal dysrhythmias or chest pain. Review serial ECGs. Provides information regarding progression/resolution of infarction, status of ventricular function, electrolyte balance, and effects of drug therapies. Review chest x-ray. May reflect pulmonary edema related to ventricular dysfunction. Monitor laboratory data, e.g., cardiac enzymes, ABGs, electrolytes. Enzymes monitor resolution/extension of infarction. Presence of hypoxia indicates need for supplemental oxygen. Electrolyte imbalance, e.g., hypokalemia/hyperkalemia, adversely affects cardiac rhythm/contractility. Administer antidysrhythmic drugs as indicated. (Refer to CP: Dysrhythmias.) Dysrhythmias are usually treated symptomatically, except for PVCs, which are often treated prophylactically. Early inclusion of ACE inhibitor therapy (especially in presence of large anterior MI, ventricular aneurysm, or HF) enhances ventricular output, increases survival, and may slow progression of HF. Note: Use of routine lidocaine is no longer recommended. Assist with insertion/maintain pacemaker, when used. Pacing may be a temporary support measure during acute phase or may be needed permanently if infarction severely damages conduction system, impairing systolic function. Evaluation is based on echocardiography or radionuclide ventriculography. Demonstrate adequate perfusion as individually appropriate, e.g., skin warm and dry, peripheral pulses present/strong, vital signs within patient’s normal range, patient alert/oriented, balanced I&O, absence of edema, free of pain/discomfort. Investigate sudden changes or continued alterations in mentation, e.g., anxiety, confusion, lethargy, stupor. Cerebral perfusion is directly related to cardiac output and is also influenced by electrolyte/acid-base variations, hypoxia, and systemic emboli. Inspect for pallor, cyanosis, mottling, cool/clammy skin. Note strength of peripheral pulse. Systemic vasoconstriction resulting from diminished cardiac output may be evidenced by decreased skin perfusion and diminished pulses. Monitor respirations, note work of breathing. Cardiac pump failure and/or ischemic pain may precipitate respiratory distress; however, sudden/continued dyspnea may indicate thromboembolic pulmonary complications. Monitor intake, note changes in urine output. Record urine specific gravity as indicated. Decreased intake/persistent nausea may result in reduced circulating volume, which negatively affects perfusion and organ function. Specific gravity measurements reflect hydration status and renal function. Assess GI function, noting anorexia, decreased/absent bowel sounds, nausea/vomiting, abdominal distension, constipation. Reduced blood flow to mesentery can produce GI dysfunction, e.g., loss of peristalsis. Problems may be potentiated/aggravated by use of analgesics, decreased activity, and dietary changes. Encourage active/passive leg exercises, avoidance of isometric exercises. Enhances venous return, reduces venous stasis, and decreases risk of thrombophlebitis; however, isometric exercises can adversely affect cardiac output by increasing myocardial work and oxygen consumption. Assess for Homans’ sign (pain in calf on dorsiflexion), erythema, edema. Indicators of deep vein thrombosis (DVT), although DVT can be present without a positive Homans’ sign. Instruct patient in application/periodic removal of antiembolic hose, when used. Limits venous stasis, improves venous return, and reduces risk of thrombophlebitis in patient who is limited in activity. Monitor laboratory data, e.g., ABGs, BUN, creatinine, electrolytes, coagulation studies (PT, aPTT, clotting times). Indicators of organ perfusion/function. Abnormalities in coagulation may occur as a result of therapeutic measures (e.g., heparin/Coumadin use and some cardiac drugs). Administer medications as indicated:Antiplatelet agents, e.g., aspirin, abciximab (ReoPro), clopidogrel (Plavix); Reduces mortality in MI patients, and is taken daily. Aspirin also reduces coronary reocclusion after percutaneous transluminal coronary angioplasty (PTCA). ReoPro is an IV drug used as an adjunct to PTCA for prevention of acute ischemic complications. Low-dose heparin is given during PTCA and may be given prophylactically in high-risk patients (e.g., atrial fibrillation, obesity, ventricular aneurysm, or history of thrombophlebitis) to reduce risk of thrombophlebitis or mural thrombus formation. Oral anticoagulants, e.g., anisindione (Miradon), warfarin (Coumadin) Used for prophylaxis and treatment of thromboembolic complications associated with MI. Cimetidine (Tagamet), ranitidine (Zantac), antacids; Reduces or neutralizes gastric acid, preventing discomfort and gastric irritation, especially in presence of reduced mucosal circulation. Administer thrombolytic agents, e.g., alteplase (Activase, rt-PA), reteplase (Retavase), streptokinase (Streptase), anistreplase (Eminase), urokinase, (Abbokinase); Thrombolytic therapy is the treatment of choice (when initiated within 6 hr) to dissolve the clot (if that is the cause of the MI) and restore perfusion of the myocardium. Prepare for PTCA (balloon angioplasty), with/without intracoronary stents; This procedure is used to open partially blocked coronary arteries before they become totally blocked. The mechanism includes a combination of vessel stretching and plaque compression. Intracoronary stents may be placed at the time of PTCA to provide structural support within the coronary artery and improve the odds of long-term patency. Transfer to critical care. More intensive monitoring and aggressive interventions are necessary to promote optimum outcome. Maintain fluid balance as evidenced by BP within patient’s normal limits. Be free of peripheral/venous distension and dependent edema, with lungs clear and weight stable. Auscultate breath sounds for presence of crackles. May indicate pulmonary edema secondary to cardiac decompensation. Note JVD, development of dependent edema. Suggests developing congestive failure/fluid volume excess. Measure I&O, noting decrease in output, concentrated appearance. Calculate fluid balance. Decreased cardiac output results in impaired kidney perfusion, sodium/water retention, and reduced urine output. Weigh daily. Sudden changes in weight reflect alterations in fluid balance. Maintain total fluid intake at 2000 mL/24 hr within cardiovascular tolerance. Meets normal adult body fluid requirements, but may require alteration/restriction in presence of cardiac decompensation. Provide low-sodium diet/beverages. Sodium enhances fluid retention and should therefore be restricted during active MI phase and/or if heart failure is present. Administer diuretics, e.g., furosemide (Lasix), spironolactone with hydrochlorothiazide (Aldactazide), hydralazine (Apresoline). May be necessary to correct fluid overload. Drug choice is usually dependent on acute/chronic nature of symptoms. Monitor potassium as indicated. Hypokalemia can limit effectiveness of therapy and can occur with use of potassium-depleting diuretics. Verbalize understanding of condition, potential complications, individual risk factors, and function of pacemaker (if used). Relate signs of pacemaker failure. List desired action and possible adverse side effects of medications. Assess patient/SO level of knowledge and ability/desire to learn. Necessary for creation of individual instruction plan.Reinforces expectation that this will be a “learning experience.” Verbalization identifies misunderstandings and allows for clarification. Be alert to signs of avoidance, e.g., changing subject away from information being presented or extremes of behavior (withdrawal/euphoria). Natural defense mechanisms, such as anger or denial of significance of situation, can block learning, affecting patient’s response and ability to assimilate information. Changing to a less formal/structured style may be more effective until patient/SO is ready to accept/deal with current situation. Present information in varied learning formats, e.g., programmed books, audiovisual tapes, question-and-answer sessions, group activities. Using multiple learning methods enhances retention of material. Reinforce explanations of risk factors, dietary/activity restrictions, medications, and symptoms requiring immediate medical attention. Provides opportunity for patient to retain information and to assume control/participate in rehabilitation program.Note: Routine use of supplements/herbal remedies (e.g., ginkgo biloba, garlic, vitamin E) can result in alterations in blood clotting, especially when anticoagulant/ASA therapy is prescribed. Encourage identification/reduction of individual risk factors, e.g., smoking/alcohol consumption, obesity. These behaviors/chemicals have direct adverse effects on cardiovascular function and may impede recovery, increase risk for complications. Warn against isometric activity, Valsalva maneuver, and activities requiring arms positioned above head. These activities greatly increase cardiac workload and myocardial oxygen consumption and may adversely affect myocardial contractility/output. Review programmed increases in levels of activity. Educate patient regarding gradual resumption of activities, e.g., walking, work, recreational and sexual activity. Provide guidelines for gradually increasing activity and instruction regarding target heart rate and pulse taking, as appropriate. Gradual increase in activity increases strength and prevents overexertion, may enhance collateral circulation, and allows return to normal lifestyle.Note: Sexual activity can be safely resumed once patient can accomplish activity equivalent to climbing two flights of stairs without adverse cardiac effects. Identify alternative activities for “bad weather” days, such as measured walking in house or shopping mall. Provides for continuing daily activity program. Review signs/symptoms requiring reduction in activity and notification of healthcare provider. Differentiate between increased heart rate that normally occurs during various activities and worsening signs of cardiac stress (e.g., chest pain, dyspnea, palpitations, increased heart rate lasting more than 15 min after cessation of activity, excessive fatigue the following day). Pulse elevations beyond established limits, development of chest pain, or dyspnea may require changes in exercise and medication regimen. Stress importance of follow-up care, and identify community resources/support groups, e.g., cardiac rehabilitation programs, “coronary clubs,” smoking cessation clinics. Reinforces that this is an ongoing/continuing health problem for which support/assistance is available after discharge. Note: After discharge, patients encounter limitations in physical functioning and often incur difficulty with emotional, social, and role functioning requiring ongoing support. Emphasize importance of contacting physician if chest pain, change in anginal pattern, or other symptoms recur. Timely evaluation/intervention may prevent complications. Stress importance of reporting development of fever in association with diffuse/atypical chest pain (pleural, pericardial) and joint pain. Post-MI complication of pericardial inflammation (Dressler’s syndrome) requires further medical evaluation/intervention. Encourage patient/SO to share concerns/feelings. Discuss signs of pathological depression versus transient feelings frequently associated with major life events. Recommend seeking professional help if depressed feelings persist. Depressed patients have a greater risk of dying 6–18 mo following a heart attack. Timely intervention may be beneficial. Note: Selective serotonin reuptake inhibitors (SSRIs), e.g., paroxetine (Paxil), have been found to be as effective as tricyclic antidepressants but with significantly fewer adverse cardiac complications.